Dinosaurs in the classroom? Get out the naughty step: it’s havoc! A funny lesson in behaviour is called for… We’re sure you’ll agree: nothing livens up school like an invasion of dinosaurs. There’s just one problem. These dinos don’t love learning – they love being naughty! They’ve squashed the bookshelf, eaten the board and left claw marks on the wall. Oh yes, and there’s one more problem. 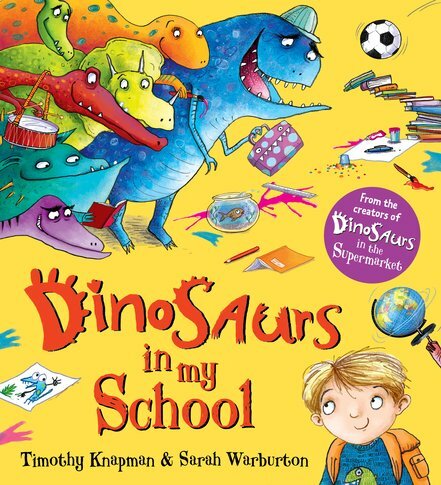 The teacher can’t see them… A cheeky delight: if you read Dinosaurs in the Supermarket, you’ll already know just how much fun this will be.